Interior design doesn’t come easily to everyone, and sometimes we can all do with a helping hand to come up with exactly the right look. Staircase design is no different; in fact, it can be even harder to get right, as there is very little room for error. Stairs are an important structural feature of the home, and can’t be changed as quickly as the décor, so it pays to choose carefully and do some research beforehand. After all, if you pick the wrong style you will probably have to live with it for a long time. 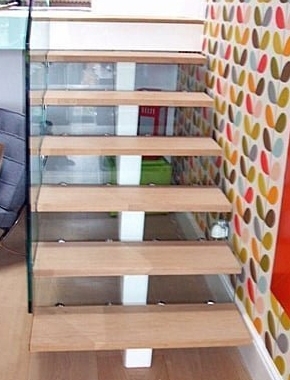 One great place to look for stair design ideas is our Case Studies section. Packed with staircase photos, drawings and customer testimonials, it features hundreds of wonderful staircases of all shapes and sizes – ideal for helping you decide what style might suit your own home. We frequently receive enquiries about inspirational stairs that visitors have spotted on our website. Only last month a potential customer contacted us to ask if we could design a staircase similar to this impressive example that we produced some time ago for a property in Shropshire. Anchored by a central spine made from powder-coated steel, the staircase incorporates high-quality oak treads and a minimalist glass balustrade for a light-enhancing, contemporary look. The client said afterwards: "We are very pleased with the final product. The glass gives the appearance that there is no balustrade and that the stairs are completely open." Take a look at Case Study 146 for more pictures and design drawings. A few more examples of our most popular stair case studies are shown below.